The Infinite Spur is Alaska’s ultimate test-piece and one of the world’s finest alpine challenges. This aesthetic arête soars nearly nine thousand feet directly up the south face of the second highest mountain in the range, providing a uniquely safe passage up a wall of total chaos. The extended length and extreme commitment required make this route a formidable and intimidating endeavor. However, the rewards of climbing such a perfect line on this incredibly complex mountain are immeasurable. 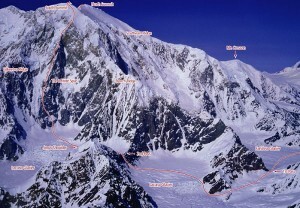 This route has been a distinguishing highlight in the lives of each alpinist that has completed it. Which SuperTopo guidebooks include a topo for Infinite Spur?